Buy the ZeverSolar ZL3680 inverter at the lowest price – online only. The strength of this inverter lies in its great voltage range. It starts at 80 V which allows you to start producing very early in the morning and continue until late at night (eg. when the sun is low). It isn't equipped with a transformer to offer a maximum output of up to 97,2%, one of the best in its category. PhotonTest, an independent organisation which tests all the inverters available on the market, has listed this inverter in its Top 10 after testing more than 150 models. The company SMA, the market leader in solar inverters, acquired the company ZerverSolar in 2013. This acquisition enabled ZerverSolar to futher optimize its machinery and to improve product quality even more. The ZL3680 inverter is one of the least expensive inverters available on the market. The ZL3680 inverter is equipped with 2 MPPT trackers in a three-phase pump. Therefore, you have the option to install your solar panels on two different roofs. Output raised to 97.2%: The ZeverSolar Zeverlution inverter has one of the best outputs of its range, particularly in partial shading. Thanks to its large voltage range, it produces electricity in an optimal manner from early in the morning until late at night. Low price: ZeverSolar aims to make its range of inverters accessible to a wider range of customers and offers them at very attractive prices. Order on Alma-Solarshop and you will get the lowest price on the market for your inverter. WIFI connection: Connect your ZeverSolar Zeverlution inverter to collect all the information about your installation. Monitor it for free using the iOS or Android app ZeverCom. 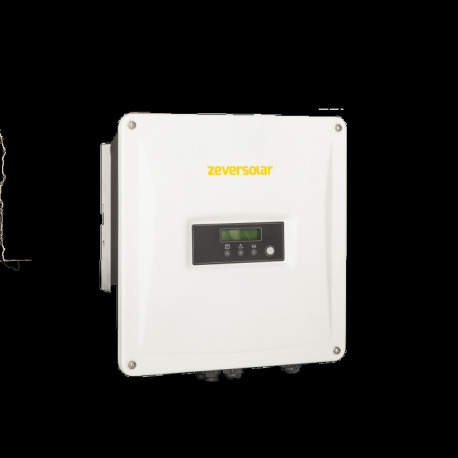 2 independent trackers: The ZeverSolar inverter has 2 independent inlets allowing your photovoltaic panels to be installed in two different locations (eg. facing east and west on the roof). The ZeverSolar inverter garantees the best production possible at each input. Lightweight: ZeverSolar ZL3680 is not equipped with a transformer and has the advantage of being light-weight. Connecting it to your photovoltaic panels is very easy. Quick start: The Zeverlution ZL3680 from ZeverSolar starts quickly. Using the lowest start-up voltage available on the market, the ZeverSolar inverters produce energy from the first rays of sunlight. Your production gain totals almost 5%. Single-phased inverter: The ZeverSolar Zeverlution ZL3680 is a single phase inverter. Applies solely to the following products: Eversol, Evershine and Power Monitoring Unit. The statutory warranty obligation of the seller of your device is not affected by this warranty and remains fully valid for 24 months from the date of delivery. For the above mentioned products, you receive a zeversolar factory warranty valid for 5 years from the date of purchase. For Power Monitoring Unit, you will receive a factory warranty valid for 2 years from the date of purchase. The zeversolar factory warranty covers any costs for repair or spare parts during the agreed period beginning on the date of purchase of the device, subject to the following conditions. This is not associated with a durability warranty. If a device becomes defective during the agreed zeversolar factory warranty period and, unless this should be impossible or disproportionate, one of the following options will be selected by zeversolar, device repair at zeversolar, or device repair on-site, or exchange for a replacement device of equivalent value with regard to model and age. - after consideration of alternative workaround possibilities that zeversolar customers could revert to without significant inconvenience. The factory warranty includes the costs of zeversolar for work and material for the restoration of faultless functioning in zeversolar's factory or for on-site repair work by zeversolar service personnel. All other costs, particularly shipping costs, travel, and accommodation costs of zeversolar personnel for on-site repairs as well as costs of the customer's own employees are not included in the factory warranty. To determine the warranty entitlement, please submit a copy of the purchasing invoice or a copy of the warranty certificate, if necessary including the receipt of the extended warranty. The type label on the device must be completely legible. Otherwise, zeversolar is entitled to refuse to provide warranty services. Report defective devices with a detailed error description and the error code to the zeversolar Service Line. If we agree to a replacement, we generally send an equivalent replacement device, packaged appropriately for transport, within 5 working days. The defective device is to be packed in this transport packaging for return transport to zeversolar. All warranty services are free of charge only if the course of action is agreed with zeversolar in advance. Neither does it cover cosmetic defects which do not influence the energy production. Claims that go beyond the rights cited in the warranty conditions, in particular claims for compensation for direct or indirect damages arising from the defective device, for compensation for costs arising from disassembly and installation, or loss of profits are not covered by the manufacturer warranty, insofar zeversolar is not subject to statutory liability. In such cases, please contact the company that sold you the device. Possible claims in accordance with the law on product liability remain unaffected. All claims arising from or in connection with this warranty are subject to German law. Kassel, Germany is the exclusive place of jurisdiction for all disputes arising from or in connection with this warranty.